Frequency is a crisp, clean iPad app to watch and share videos from curated channels, your social networks, and your YouTube account. Frequency’s simple navigation and neatly organized tools will simplify the process of watching your favorite videos, and, in turn, will decrease the frustrating visual clutter of web-based video streaming. To get started with the Frequency iPad app, you can connect with your Facebook account or a Frequency account. An additional option on the opening screen allows you to understand the tools and navigation. I would recommend taking a peak at the simple and concise tutorial screen. As the home screen fades, straight lines connect the icons with a brief description of the functionality. Your next step is to touch the settings wheel in the top right hand corner of the screen. You can connect with Facebook, Twitter, and YouTube. The Facebook log-in allows you to select your privacy filters and posting preferences. If you want to post everything to your Facebook timeline, then this is the time to make that choice. If you do not choose to automatically post your activity, then you can still like and tweet at your discretion. YouTube has two different feeds–one for your channels and one for your uploads. You will particularly appreciate the chance to watch your uploads with just a couple of swipes of your finger and a tap. In addition to your social networks, you can also explore and add channels covering a range of topics from trending and news to food, sports, celebrity, and technology. The best way to select channels is to tap the list icon in the upper left hand corner of the screen. The most popular channels are listed, but you can also touch the arrow at the top of the channels list to access categories. There is something informative and life-enhancing for everyone. Top Gear, Lifehacker, ESPN, Wired, Sesame Street, Team Coco, and the Wall Street Journal are just a few of the selections available. You will want to touch the matrix icon next to the list icon after you have made your selections of channels. You can explore the content with interesting interface. There is a bar just below the top menu bar with an icon for each channel and the rest of the screen fills with a grid of the most recent videos for each channel. You can scroll from one channel to the next with horizontal swipes, then you check out the videos in a channel with vertical swipes. When you play a video, you can touch the left hand corner of the video player and the channel’s feed will slide onto the screen. A vertical gesture control allows you to check out the feed without interrupting the play of the video. Or, if you want to move from one video to the next, you simply touch one of the arrows in the right side of each video. There are simple one-touch sharing icons to add to favorites, add to watch later, share by email, post to Twitter, and like on Facebook. The visual quality and sound, as always, depends on the quality of the video. Frequency has a lot of similarities to ShowYou, but it doesn’t create a new social network. Frequency allows you to follow and share your friends’ videos and your favorite channels, but it leaves you the ability to decide whether or not you want to share. Visually, Frequency is bright and vivid, and ShowYou has a darker, movie theater vibe. 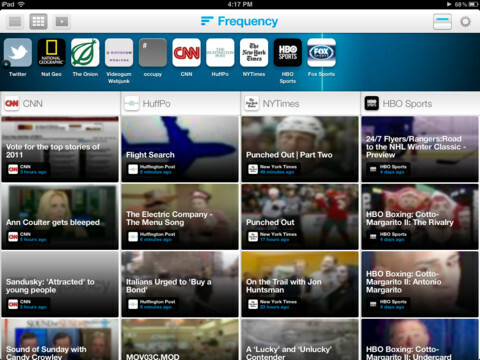 Frequency is an excellent, well-crafted iPad app to watch your favorite videos with simplicity and ease. AppSafari review of Frequency ~ Tune In, Watch Videos was written by Jenni Ward on November 19th, 2012 and categorized under App Store, Featured, Free, iPad apps, Music, News, Social, Sports, Video. Page viewed 5252 times, 3 so far today. Need help on using these apps? Please read the Help Page.